Secret Boxes, or Puzzle Boxes, however you want to call them, have some of the greatest designs in mechanical puzzles. Just look at some of the Karakuri boxes and you'll see what I mean. 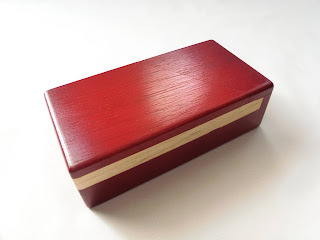 The problem with Karakuri boxes and similar ones is that they're very expensive. However, not every Puzzle Box is that expensive, and PuzzleMaster has some good and affordable ones produced by themselves. The Secret Opening Box 2 is a beauty. Made as an improved version of the original Secret Opening Box, this one turned out to be almost perfect. The only thing lacking, in my opinion, is some kind of motif or carving on the top, as the icing on the cake. Otherwise, the design is gorgeous with a striking visual effect of two contrasting wood types, dark red and plain wood (almost golden). It'll look great on any desk or coffee table. The inside compartment is slightly smaller than a standard-sized deck of cards, but if you want to surprise someone with it, I'm sure you can think of something special to put inside it. The puzzle has an average size for a Secret Box with measurements of 14.6 x 4.5 x 7.6cm (5.8" x 1.8" x 3"). 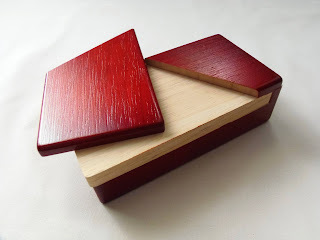 This box is perfect for anyone starting with this type of puzzles, even if you want to offer it to someone not used at solving mechanical puzzles. It has a difficulty level of 6/10, so if you ever solved any of these, you can open it in just a couple of minutes, which is the time it takes approximately to study its mechanism. It takes only three moves to open the box, with the final one being just a little tricky, although it's a common move found in other puzzles. When you first pick it up, you immediately discover its first move, which is just to slide the top lid clock-wise. After this, you can pull the lid back a little, but it won't move farther out. Something is blocking its movement. The third and final move requires just a bit more thinking, but with some persistence you'll get the box open. Who says great puzzles have to be crazy expensive? The Secret Opening Box 2 is a perfect example of superb craftsmanship at a very affordable price. 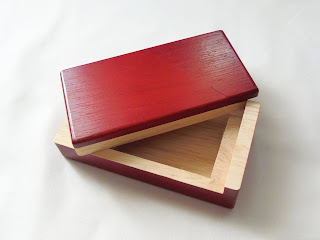 If you have experience with Puzzle Boxes, this one offers very little challenge. However, regardless of how challenging it is, or lack thereof, it's a great addition to any collection. Availability: Since this is a PuzzleMaster brand puzzle, you'll probably find it at PuzzleMaster only. You can get a copy of the Secret Opening Box 2 for just $16 CAD.